Xi'an is an ancient city with a long-standing history and is known for being the capital city for 13 dynasties. Now, this city harmoniously combines its ancient charm with a modern atmosphere. It is also the jumping off point of the famous ancient Silk Road. 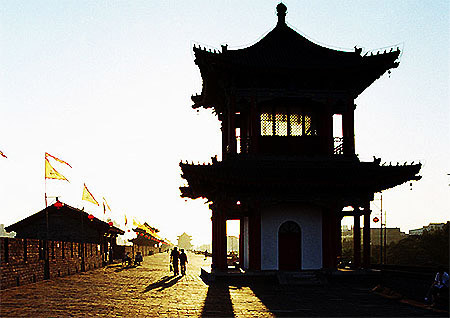 As the most important city in northwest China, Xi'an attracts millions of visitors from all over the world with its historical relics, unique landscapes as well as its unique local cuisine. Xi'an Xianyang International Airport is the major airport serving the city and is the largest airport in the northwest region of China. The airport is located to the northwest of the city, between Xi'an and Xianyang(咸阳). There are direct flights from Xi'an to many major cities in China. There are shuttle busses between the airport and the urban area with a 25 Yuan admission fee per person. Alternatively, at a price of 100 - 120 Yuan the journey can be made by taxi. Here we will offer some information on shuttle bus in detail. 1. Line 1-between airport and Melody Hotel(西安美伦酒店) near the Bell Tower Tourists can reach many luxurious hotels in the city center by this line, like Hyatt Regency(西安凯悦饭店), Howard Johnson Ginwa Plaza Hotel(金花豪生国际大酒店), Bell Tower Hotel(西安钟楼饭店), Prince International Hotel(王子国际酒店)and City Hotel(西安城市酒店), etc. 2. Line 2-between airport and railway station, passes by Qinfeng Hotel(西安秦丰大酒店)and Jiefang Hotel(解放饭店), passengers can take this line to get to the Diamond International Hotel(西安钻石国际大酒店). 4. Line 4-between airport and Guomao Dasha(国贸大厦)in southern suburb, passes by Tangcheng Hotel(西安唐城宾馆)and Orient Hotel(东方大酒店). 5. Line 5-between airport and Jianguo Hotel(建国饭店) in eastern suburb, passes by Empress Hotel. 6. Line 6- is between airport and downtown Xianyang, which passes Caihong Hotel of Xianyang City. Though shuttle bus departing at downtown area leaves hourly from 6:00 to 18:00 for airport, the line 2 to 5 may be not in service after 15:00 or 16:00 except Line 1. While the departing time of bus from airport to downtown be according to the arrival time of flights. Even passengers of late arrivals can catch the service, but it will take passengers to Melody Hotel (near the Bell Tower) possibly not on to other destinations of lines above. So if your hotel is not in the lime, you’d better first get to the Bell Tower, which is the center of Xi’an, and then transfer a bus or taxi to get to your hotel. With a reputation as 'the Gateway to the West', Xi'an Railway Station is one of the most pivotal terminals of the domestic railway system. You can take a direct train to Xi’an from almost cities in China. The station lies in the north urban area, so it will take you about half an hour by car from the downtown area. Buses traveling to the railway station can be found on every main street, and will only cost you 1 or 2 Yuan. If you choose to travel by taxi, the fare should be less than 10 Yuan (from the city center). Purchasing train tickets can be troublesome for foreigners, as the ticket windows are usually crowded and have few English-speaking staff. One solution to such a problem is to ask for the ticket-booking service at any star rated hotel, who will offer their assistance for a nominal service charge. You are better off buying train tickets one week in advance of travel, especially during the peak travel seasons. Zhu Yuanzhang, the first Emperor of the Ming Dynasty (1368-1644) began to enlarge the wall built initially during the old Tang dynasty (618 -907), creating the modern Xi'an City Wall. It's the most complete city wall that has survived in China, as well being one of the largest ancient military defensive systems in the world. After the extension, the wall now stands 12 meters tall, 12-14 meters wide at the top and 15-18 meters thick at the bottom. It covers 13.7 kilometers in length with a deep moat surrounding it. The Bell Tower, is a stately traditional building, that marks the geographical center of the ancient capital. 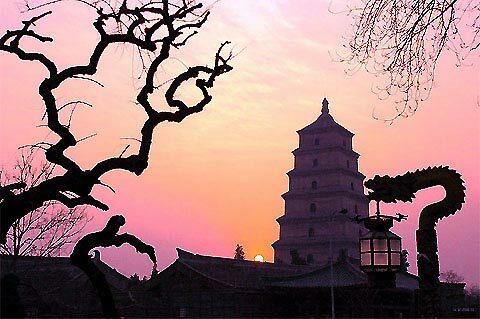 The tower was built in 1384 by Emperor Zhu Yuanzhang as a way to dominate the surrounding countryside and provide early warning of attack by rival rulers. Now the wooden tower, is the largest and best-preserved of its kind in China. As the symbol of the old-line Xi'an, Big Wild Goose Pagoda is a well-preserved ancient building and a holy place for Buddhists. It is located in the southern suburb of Xi'an City, about 4 kilometers from the downtown of the city. Surrounding Big Wild Goose Pagoda, the scenery is also quite charming, especially the square north of the Da Ci'en Temple. 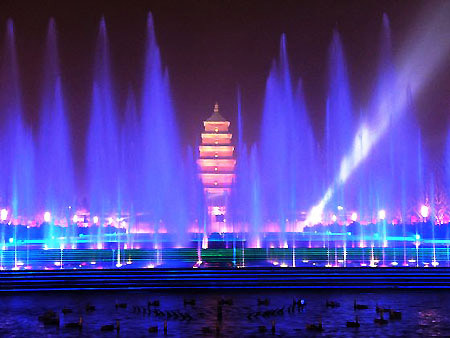 Till now, it holds many records: in Asia, it is the biggest Tang-culture square, the biggest fountain and waterscape square, and the largest-scale sculptures area. In the world, it has the most benches, the longest light-belt, and the largest-scale acoustic complex. The Terra Cotta Warriors and Horses are the most significant archeological excavations of the 20th century. It is Qin Shi Huang’s mausoleum. Upon ascending the throne at the age of 13 (in 246 BC), Qin Shi Huang, later the first Emperor of all China, had begun to work for his mausoleum. It took 11 years to finish. It is speculated that many buried treasures and sacrificial objects had accompanied the emperor in his after life. The Great Mosque in Xi'an is one of the oldest, largest and best-preserved Islamic mosques which was built in 742 during Tang Dynasty (618—907) in China and its location is northwest of the Drum Tower. Shaanxi Province is the birthplace of the ancient Chinese civilization. Xi'an City was the capital city in thirteen dynasties which in total lasted over 1100 years. Consequently, the ancient history of Shaanxi is to some degree the ancient history of China. 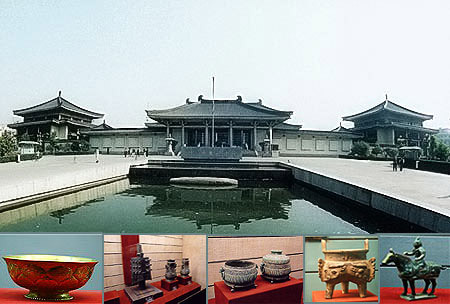 The Shaanxi History Museum considers it an obligation to be a showcase of ancient civilizations. 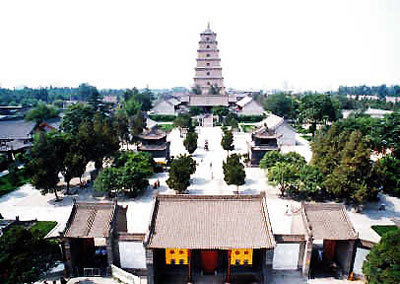 It is situated in the southern suburb of Xi'an City, northwest of the Big Wild Goose Pagoda. Since it was opened to the public in 1991, its architectural buildings, internal apparatus, and exhibits have made it famous as a first-class museum in China. 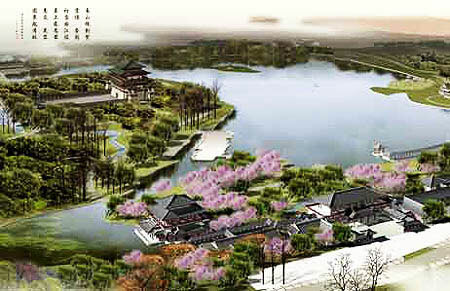 Near the Big Wild Goose Pagoda , Tang Paradise is located in the Qujiang Resort, southeast of the Xi’an City. It is a newly opened tourist attraction in April, 2005. Tang Paradise covers a total area of 1000 mu (about 165 acres) and of which 300 mu (about 49 acres) is water. This tourist attraction not only claims to be the biggest cultural theme park in the northwest region of China but also the first royal-garden-like park to give a full display of the Tang Dynasty's (618-907) culture. Altogether, twelve scenic regions are distributed throughout Tang Paradise to provide visitors with the enjoyment of twelve cultural themes and a perfect exhibition of the grandness, prosperity and brilliance of the culture of the Tang Dynasty. In China, many temples house treasures and artifacts, but the sheer quantity and quality of treasures in the Famen Temple is rare. Situated in Famen Town of Fufeng County, about 120 kilometers (about 74.57 miles) west of Xi'an, Famen Temple is renowned for storing the veritable Finger Bone of the Sakyamuni Buddha. Famen Temple was established in the Eastern Han Dynasty (25--220), for carrying forward Buddhism. 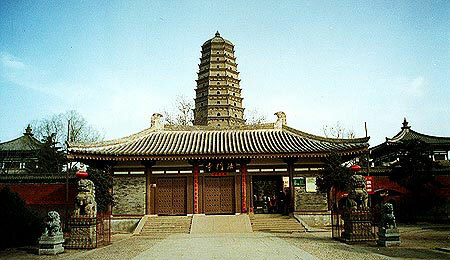 The most representative structures in the temple are the Famen Temple Pagoda and Famen Temple Museum. The Tang Dynasty Music and Dance Show, a wonderful performance of the ancient music and dance, is a must when you visit Xi'an. The city, which was formerly known as Chang'an has a very long history, and was the imperial capital during 13 dynastic periods. Of these, the Tang Dynasty (618 - 907) was the most prosperous and glorious of all. The Tang Dynasty Music and Dance Show is an outstanding exponent of this ancient stable and prosperous society, keeping alive its splendid culture and providing an insight into the peaceful life style of the period. Situated near the city center of Xi'an, the Tang Dynasty Palace boasts that it is China's premier cultural entertainment theatre restaurant. Established in 1988, the Tang Dynasty Palace has cooperated with the Shaanxi Provincial Song & Dance Troupe and has staged the Tang Dynasty Music and Dance Show, which has proved to be a great success and is welcomed by numerous audiences, especially foreign visitors. In addition to appreciating the wonderful performance, you can also enjoy the delicious meals provided at the Tang Dynasty Palace. With its large auditorium of over 2,000 square meters, it can comfortably hold about 600 diners at a time. The various savory dishes together with the exciting show will be sure to give satisfaction to your appetite, your eyes and your mind. Established in 1998, the Shaanxi Song & Dance Theatre is a comprehensive theatre restaurant, providing a permanent stage for the Shaanxi Provincial Song & Dance Troupe. Thus the artists can perform the Tang Dynasty Music and Dance Show on their own stage. Having accommodation for 700 customers, the Shaanxi Song & Dance Theatre will also provide you excellent services and enjoyment. They can pick you up from the railway station free. Praised as 'the capital of table delicacies", Xi'an has been rich in the delicious Shaanxi snack, delicate Guangdong Cuisine, various kinds of fashionable foreign delicacies, and popular Sichuan Cuisine such as the hot pot. Here we only introduce you the local food. 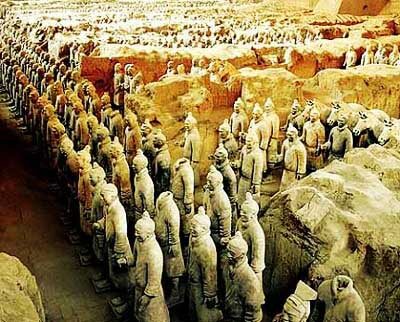 Visitors to Xi'an must do two things: one is to see the clay figures of terra cotta warriors and horses. 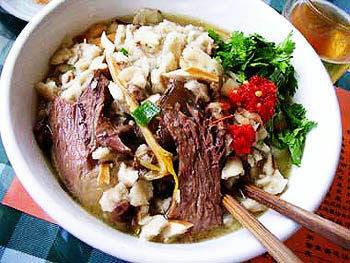 The other is to taste Yang Rou Pao Mo, which is a soup dish that involves breaking wheat flour flat bread into a bowl and adding a delicious mutton stock. Yang Rou Pao Mo might not sound as though it could become a favorite with you but if you are seeking to experience something of the local food of the people of western China, this is well worth a try. Recommended Restaurant: Many restaurants in Xi'an serve Yang Rou Pao Mo but among the best known is the Lao Sun Jia(老孙家),which is located in NO,354 Dong Da Jie, Beilin District and established in 1898 and the Tong Sheng Xiang(同盛祥) where they have been serving excellent food for almost a century in the Xi'an Bell and Drum Tower Square. Recommended Restaurant: De Fa Chang Dumpling Restaurant(德发长饺子馆), which is located in the Xi'an Bell and Drum Tower Square. Its Dumpling Banquet is very famous. 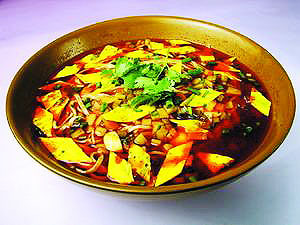 Qinshan noodles have a long history and became well-known as early as Qing Dynasty. The noodles must be hand-made of good wheat flour. The ingredients include pork shreds, day lily, egg, wood fungus, and so on. When they are served, there is ore soup, which tastes sour and hot than noodles in the bowl. 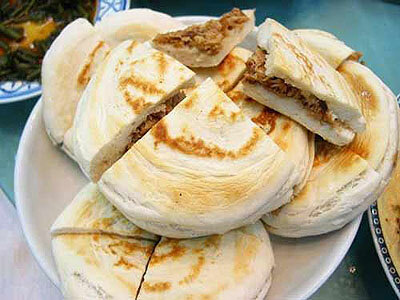 Fan’s Cured meat in pancakes is one of the traditional Shaanxi delicacies. In fact they are pancakes made of high-quality wheat flour stuffed with cured meats. 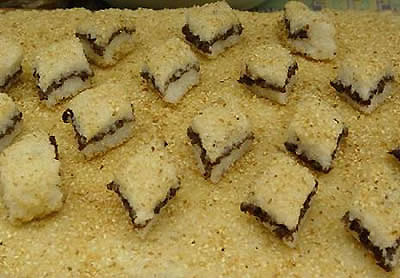 Glutinous Rice with Jujube is a traditional snack for breakfast in central Shaanxi. 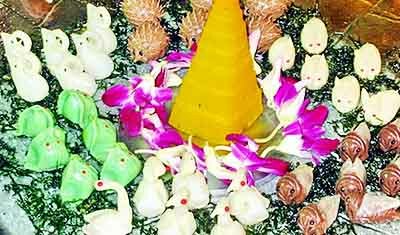 It is made from glutinous rice and dates in a steamer. Xi'an is the most important city in northwest China, and so there are a lot of shopping outlets for locals and tourists alike. There are many big shopping centers, department stores and supermarkets in and around Xi'an city. You can choose what you like in the following places. Under the ancient city wall behind the Forest of Steles in Xi'an, there is a well-known street in the style of ancient towns - Shu Yuan Men. Both sides of the slab stone road are lined with buildings in the Ming and Qing styles. 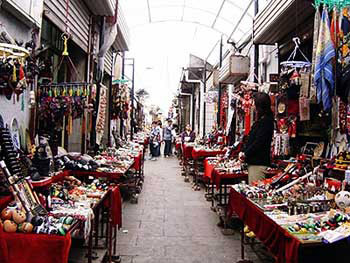 Various crafts and arts are sold on this crowded street all year long. Historical relics, calligraphy, paintings, antiques, jewels, and folk art fine works are all tourist favorites. Xi’an Antique Market is located at the intersection of Zhuque Lu and Nan Erhuan Lu (Southern 2nd Ring Road) near the Small Wild Goose Pagoda. From large furniture to small coins, the market contains every possible antique known to collectors - but you should be on guard against replicas. Wenbaozhai Tour Shopping Center of Xi’an is one of the earliest fixed tour shops for foreign travelers in the Northwest. It is an important window opening Xi,an to the outside world, gaining the unanimous praise of Chinese and foreign guests. Dealers sell silk rugs, woolen blankets, silk clothing, jewels, jade articles, calligraphy, paintings, historical relics, antiques, model clay figures of warriors and horses, and bronze cars and horses - altogether 35 categories and more than 200 kinds of goods. The address is No.5 Yanta Lu Zhongduan. Peasant Painting Gallery in the east outskirts of Xi'an City is one of the most renowned gallery of Shaanxi folk crafts. Having been visited by many tourists both from home and abroad, the gallery exhibits a great deal of Peasant Painting as well as other folk crafts such as paper-cutting and shadow puppet. Professional craftsman in the gallery even can teach visitors to paint or cut. 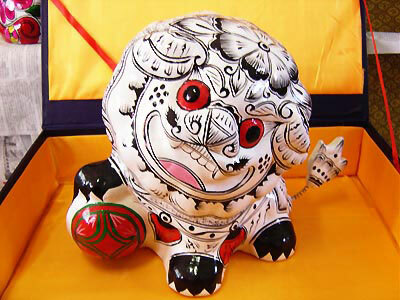 Fengxiang Painted clay figurines are made of local clay which is mixed with a pulp and is painter after it is shaped. The figurines appear in a variety of shapes which show a lot of simplicity, generality and exaggeration. 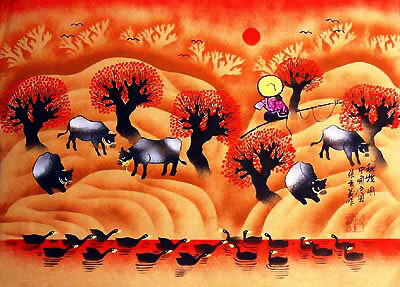 The artistic style originated from the local people’s rural life. Persons, plants, animals and birds are common subject matters of these paintings. The tri-colored glazed pottery, which is known as a splendid pearl in the art of ancient Chinese ceramics, originated In the Tang Dynasty. It Is mainly a three-colored glaze: yellow, green and brown, hence the name “tri-colored glazed pottery of the Tang Dynasty”. Xi'an is the home town of tri-colored glazed pottery. The traditional way of making tri-colored glazed wares has been carried on In Shaanxi. The shape of tri-colored glazed pottery articles is bold, vivid and life-like, and the glazed colors are mutually-permeated, multifarious, gorgeous and fully expressive. 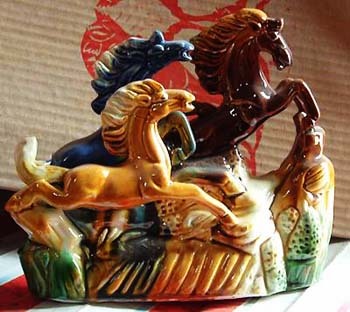 All visitors to Shaanxi think It Is a pleasure to have tri-colored glazed potteries as souvenirs. The petit-point work, also called silk-gauze-stitched embroidery, is an age-old needle-work that is popular among the people. The main Idea of this handcraft is to embroider with colored threads, stitch by stitch, strictly according to the warp and weft patterns on the fabric. The stitches of the embroidery are multifarious and complicated. 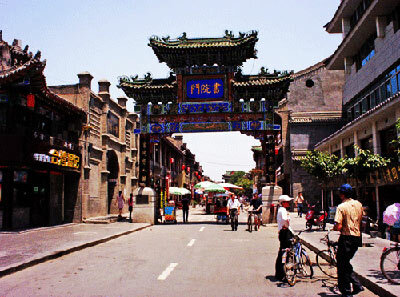 Xi’an is a world-famous city for her ancient culture. 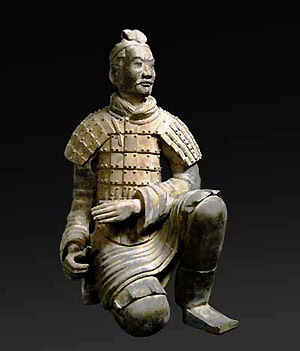 It abounds with historical sites and cultural relics, among which the terra-cotta figures of the Qin Dynasty are considered to be the most outstanding. The terra-cotta figures show a surprisingly high level in craftsmanship and sculpture, and are now hailed as “the eighth wonder of the world”. 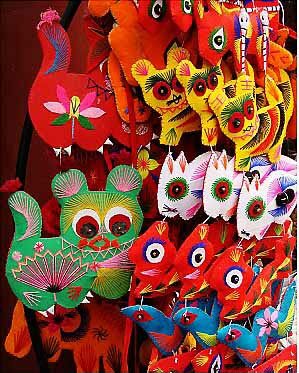 The artists and craftsmen of Xi’an have made excellent Imitation figures of all sizes. These imitations possess many good points for tourists, such as their convenient shape and portability. They make really fine souvenirs and presents for both friends and relatives.